The government-created “disaster after the disaster” continues to dominate much of our lives at the bayshore. After the physical effects of the storm faded in memory, we continue to battle the effects of government mismanagement that emerged after the storm. This month will mark six years since superstorm Sandy devastated our communities. Much of the damage has not yet been repaired and may never be repaired. The telephone line in front of my house, for example, was never replaced. I still have the downed wire that I cut down and rolled up myself during the cleanup when Verizon did not respond to repeated service calls. For most other issues it was a combination of fraud, mismanagement and red tape within the government systems that administer post-Sandy rebuilding programs are mostly to blame. We have plans to redevelop a new type of sustainable aquaculture-based community. Funding is just beginning to flow. We still lack government approval to proceed with any part of these plans. Many of the local people who initiated the “No retreat – Save the bayshore communities” campaign have sold their properties and moved out over the past year. Those who remain are deeply entrenched in a battle with government to negotiate a plan for recovery and sustainability. Almost all of the applications and project proposal applications for post-Sandy recovery work at Money Island have been denied. It is clear that our struggle is with government, not nature. Given the history of what we call “the disaster after the disaster” I am not optimistic about any immediate change in government’s role in our future recovery. We will continue to push for our recovery and long term sustainability at a grass roots level for years to come. We are able to rebuild under the various regional and local recovery plans but we need government permission and cooperation to do so. We also need funding for those aspects of the recovery projects that benefit the public interest rather than just private businesses and homeowners. Virtually all government cooperation is still lacking at this point five and a half years after Sandy. I anticipate at least two more years will be required to settle existing post-Sandy litigation and appeals and then return to the process of rebuilding. The legal battles are a waste of time and money that only enrich the lawyers on both sides but we don’t think that it is likely that government will act responsibly or come to our aid anytime soon. 1/10/2018 – In our long-term effort to restore Money Island and redevelop the resources for a future of sustainable aquaculture, it often feels like we are taking one step forward and one step back. Today the two extremes hit particularly hard. On December 30 Senator Booker sent an online message to Tony saying that he was interested in receiving more information about Baysave’s project at Money Island. That sparked a flurry of follow-up activity, calls and referrals that kept us busy all week. It is clear from multiple sources that the federal government wants to see us succeed. Early this morning I had a scheduled phone call with one of New Jersey’s best business financing experts. She works in North Jersey but was referred by Stockton SBA and has been helping us for several months. She said that she had brought our redevelopment plan to a lender who wants to fund the project and match the USDA’s program to expand aquaculture here. Great news! I worked on some spreadsheets to support the idea and we scheduled another call for Friday. Then only a few hours later a representative from the New Jersey Department of Environmental Resources called to say that the state declines to discuss a resolution of the old land use and permitting issues that existed before the Baysave project began. She seemed surprised to support the result. We discussed that this is unusual for the state to refuse to participate in alternate dispute resolution. This is copy of the confirmation letter denying alternative dispute resolution: BaySave ltr from NJDEP. I can imagine no respectable reason why the state would refuse to enter into discussions on resolution of environmental issues under any circumstances. Most personnel in the department support our efforts. I have occasionally been critical of the agency and once even turned in an employee for attempted bribery years ago. This most recent action, unfortunately, represents the agenda of a small minority of NJDEP officials. In reality, the state’s action today probably has little to do with us and has more to do with swampy politics. Nevertheless, we will continue to work our restoration and redevelopment plan one step at time, relying on the strong support expressed by the many other forces of government and the community. At the time of republishing on October 22, 2018 the Senator’s office had not replied to the letter or email. A follow-up phone call urging response did not trigger any further response. May 23, 2018 – This is a copy of an email and the attached letter sent to State Senator Van Drew today. Our community working to sustain Money Island believes that Senator Van Drew is in the best position to influence the New Jersey Department of Environmental Protection to address the inconsistent and possibly illegal internal actions of a relative few staff members who do not support the larger redevelopment and compliance plans of Money Island. Hearing the stories of other environmental activists makes me feel more confident that we are on the right track here on the bay. We have a series of meetings with regulators, investors and politicians coming up. this month This one page summary is meant to serve as a list of talking points for the discussions. This cartoon by Darrin Bell of The New Yorker illustrates the obsession we have with the false belief that “bigger is better”. 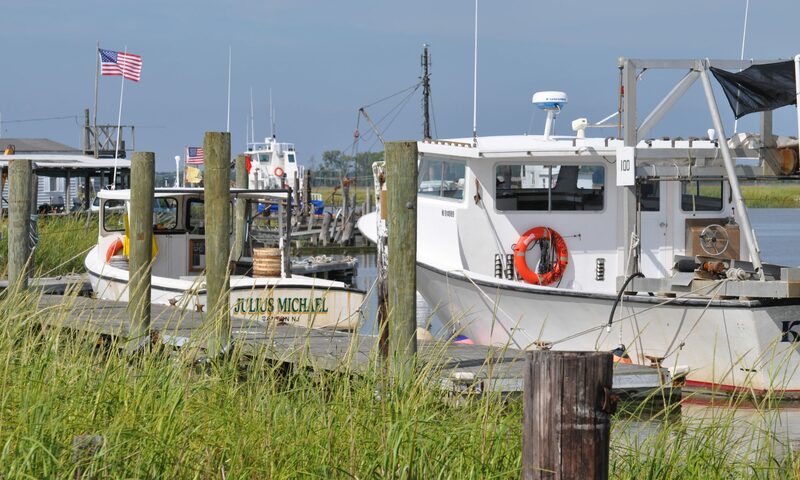 Our State of New Jersey and the Marine Fisheries Council have fallen into the trap that encourages recreational fishermen to harvest the largest breeding stock fish while throwing smaller ones back, often to die. Our fisheries scientists know that this practice is unsustainable. Yet we as a society refuse to change it. Yet we are not alone. History provides plenty of example where denial of the facts led to extinction of species, even of humans. One thing we do know about extinction is that it happens more rapidly than anyone would have guessed. We are living dangerously when we focus on “bigger is better”. Sustainable fishing depends on managing the harvest of smaller and more abundant juvenile fish. Large trophy fish should be protected, or at least should not be the target. There is no shame in that, and in fact should be promoted as a positive approach. I’ve been told directly by industry and government leaders that this practice won’t change in my lifetime no matter how loudly the scientific and environmental communities object. We live in an age where ignoring and/or denying facts is popular. All I can do is to be a voice for the truth. I am individually committed to encouraging sustainable fisheries and my small business will do what it can to change the current culture of “bigger is better”. Update: State of NJ vs Novak, et. al. STATE OF NEW JERSEY VS. NOVAK, ET. AL. 1) This is a case of government behaving badly. The state is asking for a court order after having unilaterally broken two agreements with Novak over the past six years after Novak performed in good faith. Then they denied three separate requests for problem resolution in the past year where all of the parties could have sat down and worked on a solution. The state is not entitled to behave this badly and then come into Superior Court to enlist legal muscle in its actions. 2) This is an unreasonable request. There is a coalition of government agencies, private businesses, nonprofit agencies and industry leaders – more than 20 in all – working on the sustainable and fully compliant redevelopment and compliance of Money Island Marina. Collectively, we have more than 70 active community redevelopment projects under development with more than 30 of them including land use permitting. It is unreasonable to think that any one person or entity can bring the transformation to a sustainable environmental future for this community, let alone develop those plans within a 30-day time frame requested by the state. Novak does not have the legal authority or capability to act unilaterally to take the actions requested. 3) The facts are in dispute. The state’s filed complaint and supporting certifications are so riddled with errors that it is impossible for us to know what the prosecution intends. We need a process – whether ongoing community-based planning, alternate dispute resolution process or discovery in this ongoing legal action – to determine the facts in this matter. 4) The admitted responsible parties are not involved yet. In this same Superior Court, before the same Judge, during questioning under oath, another person testified about her willingness to accept the legal and financial responsibility for the NJDEP violations to these properties. We expect that the responsible parties and local government will step forward but the legal process is expected to take another one to two years. It will likely take even longer for government to act on its already approved resolutions that will address compliance issues. 5) Other parties were not notified. It appears that all pre-hearing notices were sent to Novak’s home address in Money Island New Jersey despite notification that the other parties are not here. Novak is the only resident of the western half of Money Island and there is no indication that any other parties are aware of the State’s legal action. The state is required to make reasonable efforts notify parties before it takes legal action against them. 6) No environmental damages. The prosecution has presented ZERO evidence of any environmental damage or immediate threat to the environment. We have a stellar reputation and track record for best operating practices and environmental test results. What they are saying is that their paperwork trail wasn’t documented for decades, and internal management process has been flawed for many years before any of us were on the scene. A failure on their part does not equate to a crisis on my part. We all agree on the goal of working toward full land use compliance under new regulations that the NJDEP admits are not even promulgated yet. But this ‘crisis action’ and legal threats are not the way to do it. 7) A new master compliance plan of action is already underway. The NJDEP Acting Director of Coastal Land Use Planning has already announced the department’s intention to “work closely with this Money Island project to promulgate new regulations that are effective for the bayshore region of Cumberland County”, per our mayors in the past month. Last week the news was released that our new NJDEP Commissioner’s Office had fast-tracked and approved funding for the #1 environmental entanglement: public sewer systems for the nearby towns. We know that we will be included in the next phase and that all parties are working as quickly as possible. There is no need for this current legal action and, in fact, the legal action is slowing down the progress toward full compliance by causing some key stakeholders to remain uninvolved until after the legal action is resolved. (An electronic version of this message was submitted through the nj.gov web site on July 20, 2018. As the republishing date October 22, 2018, the Governor’s Office has not responded to calls, emails, tweets, online submission or mailed letter). 7/20/2018 – I had an interesting meeting with a well-connected civil engineer on site here at Money Island yesterday afternoon. Hours earlier, I had a long telephone conversation with the Money Island project manager for The Nature Conservancy (TNC). Both conversations added valuable insights. Higher water levels are actually good for the future of aquaculture!.It may not be good for roads, buildings or traditional infrastructure but we can certainly work around that with currently available construction modifications. Our core mission of providing public, industry and government access to local waterways will not be impaired by future water level rise. (I usually continue the conversation to discuss how Rutgers’ most recent forecasts of tidal impact and flooding trends for the next 30 to 50 years are built into our sustainability plan but don’t need to go into that detail here). Life is too short to fight the government. If we suspected that the retreat path was the opinion of state leadership, including NJDEP leadership, then we would change course. Life is too short to be in a battle against the prevailing force of government. But this is not the case. Every high-ranking official in NJDEP and state government that I’ve spoken with – probably more than two dozen by now – have all told me that they support the project and urge m to ‘stay the course’. Some warned me that the path to enlightened sustainability management will be difficult and that I will need to be persistent and ‘keep fighting’. Many of these government leaders have even given me pep talks to keep me going through this current struggle, pointing out how important this mission is to future generations. That’s what motivates me. That’s why I stick with the project. He agrees with the previously expressed project engineer’s opinion that NJDEP should not be taking the current prosecutorial actions against marina infrastructure (our infrastructure) that predate the beginning of permitting requirement laws in the 1970s. Granted, there are a lot of factual details that muddy the situation (historic photography, old land surveys, post-Sandy reconstruction law, etc.) but the core fact remains that our original marina and docks were built in the 1930s before land use permitting were required and therefore should be grandfathered to some extent. He asked several times “Why are they…?” and my response in each instance was that we don’t have the legal muscle to show where the state has made factual or legal errors in their prosecution of Money Island stakeholders. In contrast, the state has unlimited legal resources and seems intent on using these resources against us rather than negotiate through traditional problem-solving channels. I referred these factual and legal errors in the courtroom but the judge did not seem to give my objections serious consideration. Without a budget for legal defense, I don’t see any reasonable chance of addressing the state’s errors. He says that the fundamental underlying problem is that the state has not yet come to grips with the impact of water level rise on our wetlands and the infrastructure resources in these locations. While viable management approaches are proposed, we aren’t making adequate progress toward implementation. We discussed different aspects of thin layer dredge spray that is part of the Money Island sustainability plan. I suspect that not many people are familiar with this proposal so I would say only that it is public policy that makes a lot more sense from a public policy perspective than our current strategy of pumping sand on the Atlantic coast beaches! Workable sustainability solutions are available if we choose to pursue them. The usual first step in planning a project like this is called a pre-permit meeting with a wide range of stakeholders. He doesn’t understand why our requests for a meeting were declined. We discussed the thinking of certain department officials and how those have been addressed in other similar projects. His opinion, based on our exchange of bits of facts and third-party conversations, that our project does have the support of the most influential people who have been effective recently in getting the NJDEP to change their thinking about bayshore sustainability. We discussed the cost of this permitting and told me what I already knew: I would need to find a loan to cover the cost of land use permitting. we didn’t discuss that I’m already working on it or my frustration that the process is moving so slowly. Now that partial funding is available for compliance, we decided to try again.